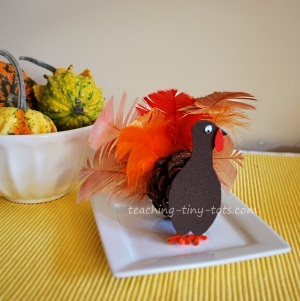 Using a pinecone, foam, feathers and wiggly eyes..make this cute Thanksgiving decoration. Use as a Thanksgiving place setting. Craft Glue such as Aleene's Quick Dry Tacky Glue for the eyes and waddle. Cut body of turkey our of foam or construction paper resembling the shape of a peanut. Cut waddle out of red foam. Glue on eye and waddle. Take two 1 inch pieces of pipe cleaner. Wrap one around the other and twist to secure. Shape to make three toes. Repeat and glue both to the back of the brown body. Select feathers and dip ends into glue and slide in between the pine cone bracts (scales of the pine cone). Put glue on the top of the pine cone (top of the pine cone). Attach the body. Set it on a flat surface and arrange the body so that the pine cone turkey stands on its own. Let dry. Arrange feet to help stabilize the pine cone if necessary. I've seen many pine cone toddler activity versions with just the head glued on but if you add a body and feet it will help the turkey stand on it's own. You can arrange the feet to help balance the pine cone turkey. Add a sticker name on the body to make it a cute place setting idea. For another toddler activity, change the feathers to tissue paper or bend chenille pipe cleaners in half to create a loop and shape like a feather. Pine Cones are great for toddler activities, however if you collect them yourselves, then need to be cleaned. Here are some ways to clean pine cones picked fresh. These were instructions I found online. I've always used store bought ones and have not tried these methods. Please let us know if there needs to be any adjustments or if you have a better way. Pour some antibacterial dish liquid soap over the pine cones in a sink and fill the sink with very warm water. Let the pine cones soak for at least 20 minutes, and drain the water. If they are not sticky, then give them a good rinse. If they are still sticky, repeat the procedure, this time using some all purpose non toxic or disinfectant household cleaner. When you are done washing the pine cones, lay them on line area with large garbage bags or grocery bags and let dry in an are where children or pets will not touch them. Place all pine cones on a foil lined baking sheet and cook for 20-30 minutes at 200 degrees F. This process will kill any insects or spider mites that may have been living in them and will cause the sap to form a glaze. Note that you should cover entire pan with foil so sap will not get onto your baking pan. Be sure to monitor throughout this process as the number and size of cones may require less time. The wild turkey we often see in photos or pictures is not the same as the domestic turkey that we serve at Thanksgiving. Domestic or tame turkeys weigh twice what a wild turkey does and are raised on farms. Most domestic turkeys are so heavy they are unable to fly. Wild turkeys, however, can fly for short distances at speeds up to 55 miles per hour. They can also reach speeds of 25 miles per hour on the ground. Turkeys have great hearing, but no external ears. They can also see in color, and have excellent visual acuity and a wide field of vision, which makes sneaking up on them difficult. Turkeys have a poor sense of smell, but an excellent sense of taste.